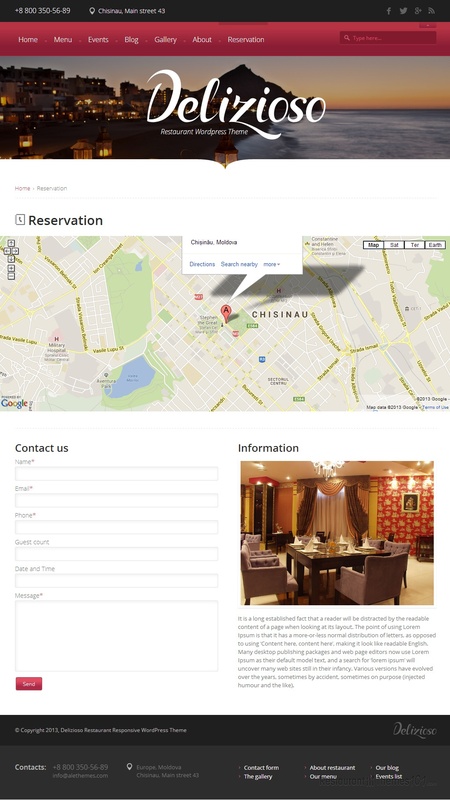 Delizioso is a gorgeous responsive restaurant WordPress theme created by CRIK0VA and presented at Themeforest. It features a beautiful layout and a whole bunch of great options that will make your website attractive and highly functional. The layout looks modern, classy and compact. The homepage features a full width slider where you can post fantastic photos of your restaurant, or photos of your delicacies. This will grab everyone’s attention and make them want to visit that cozy place and try out that mouthwatering food ASAP! The colors of this theme as shown in the live demo are lively, and they complement one another: white, black and purple with cute purple elements. In case you don’t like this exact color mixture no worries, because you will have endless color combination possibilities you can choose from, as this theme features unlimited color scheme designs. Not only will you be able to choose your own colors, there are many other customization options available and you can literally make a 100% unique website with your own set of colors by choice, your own custom backgrounds, unlimited fonts choices, and many more. An intelligent theme options panel will allow you to play around with numerous options and make the theme fit your desires perfectly. 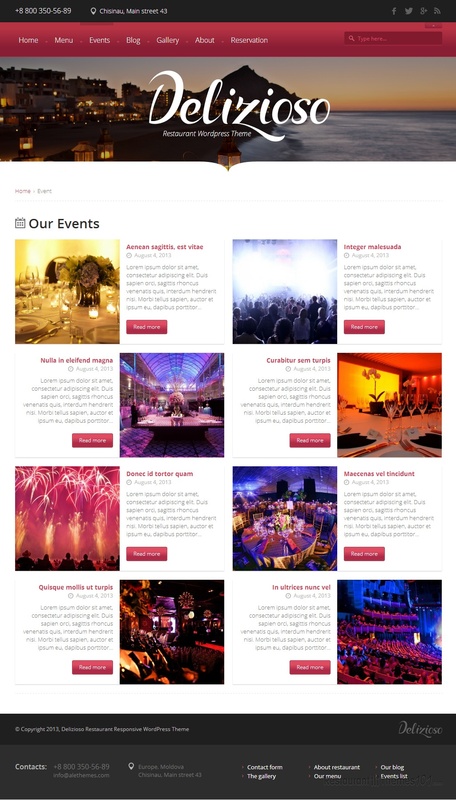 Delizioso is a theme that features 3 custom post types for galleries, events and menu. Your menu will look absolutely adorable no matter which post type you choose. It will be nicely categorized and you will be able to add a photo for each item. 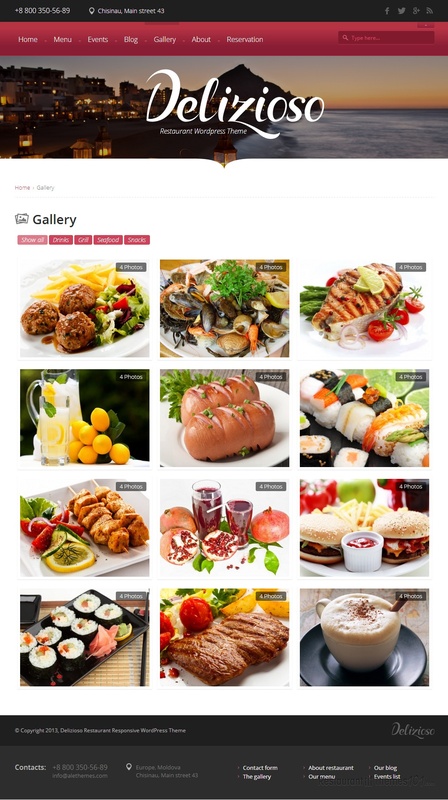 You can also feature your menu items on the homepage in a slider form and put your most popular meals in the spotlight. Featuring events on the homepage allows you to keep your visitors updated at all times so they never miss any interesting happening you might be organizing at your place. 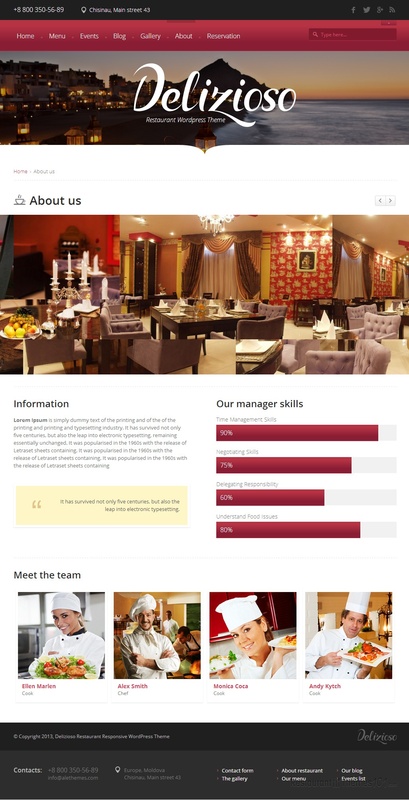 This responsive WordPress restaurant theme is already translated in several languages, and rest assure each element of the theme is completely responsive and retina ready. Your website is going to look spectacular regardless of the device it is viewed from.